Glass of Fancy » Blog Archive » Fate? - Fashion, fiction, and life in the city. Haunted by a cross-body bag! So, am I the only one who dreams about, er, shopping? I know, it’s an appalling sign of rampant consumerism and so on, and I never did it until I moved to New York, but I do sometimes dream about shopping. This mostly happens after I’ve been stalking some particular thing online (like the dream I had about trying on those fabulous Viktor & Rolf strappy sandals). Occasionally, though, I’ll just dream about shopping and finding some particularly amazing thing that I am then obsessed with even when I know perfectly well that it does not exist. 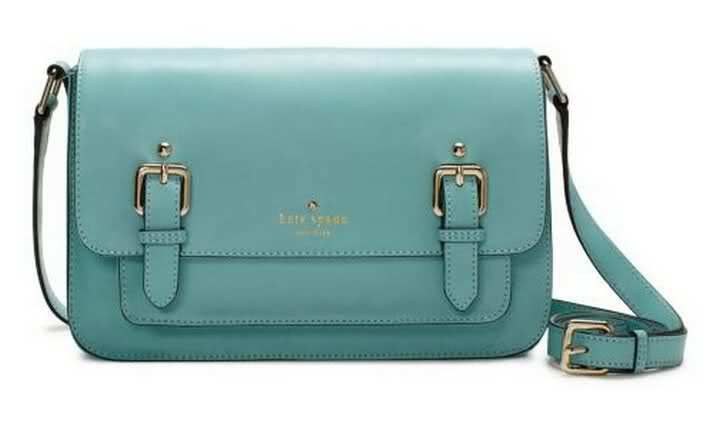 A little over a year ago, I dreamed about shopping for handbags, and I dreamed that I found a little structured fold-over Kate Spade bag in sky-blue patent leather. I am a fan of smaller bags, a fan of structure, and a fan of patent leather, so that wasn’t exactly shocking. Dreams can be strangely compelling, though; even after you’re awake, your mind can still be so full of the thing that was so important in the dream that you have trouble thinking about anything else. Despite the fact that I knew perfectly well I wasn’t likely to find sky-blue patent leather in the middle of winter, I still had to look to see if that bag actually existed — and then scour Zappos and Piperlime and Endless and every other site I could lay my hands on just to see. It didn’t exist, of course, at Kate Spade or anywhere else. So I forgot about it and moved on. Until this season. Behold the bag above. Okay, it’s not patent leather, but aside from that it’s eerily similar to the bag I dreamed about. I can’t tell you how weird this feels. It’s supposed to be an IMAGINARY bag! But here it is. I don’t really need another cross-body bag, although I do get good use out of them, but I am really having trouble turning away from this thing. My dream bag actually materialized! Does this mean I am fated to buy it? I almost feel like I’d be tempting fate NOT to buy it. The Boy says this means my dreams are prophetic. I’m hoping that doesn’t mean the dream I had last night about living in Vegas and being an illegitimate daughter of Tom Jones is about to materialize. This entry was posted on Saturday, June 25th, 2011 at 1:30 pm	and is filed under Frippery. You can follow any responses to this entry through the RSS 2.0 feed. You can leave a response, or trackback from your own site.